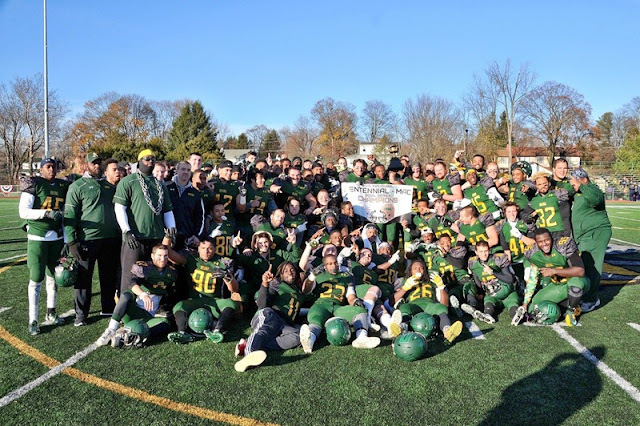 DOYLESTOWN (PA) – The Delaware Valley University football team ended its season with some hardware as the Aggies captured the Inaugural Centennial-Middle Atlantic Conference (MAC) Bowl Series with a 20-16 home triumph over Moravian College. 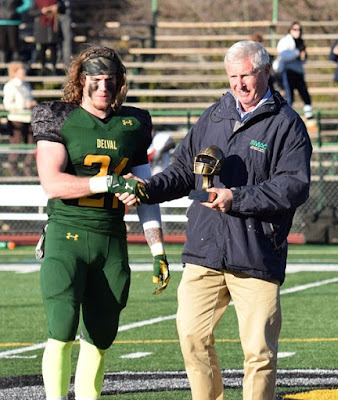 It was one of two Centennial-MAC Bowl match-ups on the day (Stevenson University posted a 14-9 win at Muhlenberg College to give the MAC a 2-0 mark in the series) as the new bowl was created in a joint effort by both conferences. For the Aggies, who had 20 new starters on the field at the end of the season comparted to last year, including all 11 on offense (seven defense, two kickers), they finished the campaign with a 9-2 record and their 12th postseason appearance in the last 13 years. Moravian, which was in its first playoff contest since 2010, ended its year with an 8-3 mark. It also marked the first time the two squads met on the gridiron since 2006, the last season the Greyhounds were members of the MAC before becoming an associate member of the Centennial Conference in football. Senior safety Danny Wynne was named the Centennial-MAC Bowl Series Most Valuable Player as the three-time, first-team all-MAC honoree registered seven tackles, including two for losses (one on a key fourth down stop), and a forced fumble. Wynne and fellow senior and captain Rashaad Lighty lifted the championship trophy at midfield after the game. Both offenses came out flying as they each scored on their first drives of the game. Moravian took the opening kickoff and marched 65 yards on seven plays. The Greyhounds had a big, third-down conversion on the third play of the drive, and capped it with Luke Gotzon’s one-yard run into the end zone. Jerome Wachter added the extra-point for a 7-0 just 2:14 into the contest. 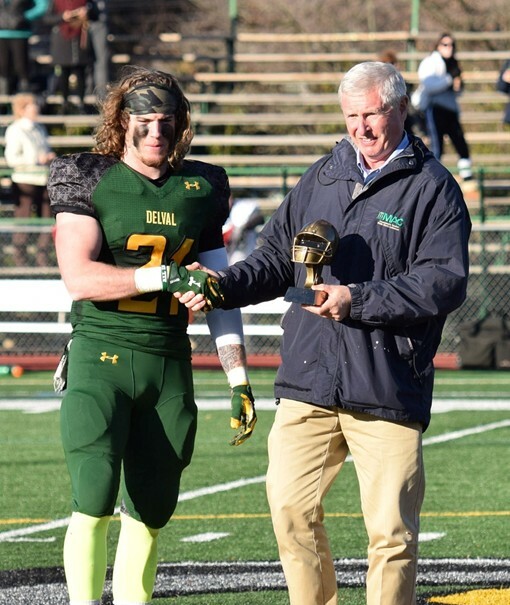 DelVal came right back and netted 24 yards on five straight running plays to put the ball at the Moravian 15. It stayed there after two more plays, bringing up fourth-and-nine. Freshman quarterback Dashawn Darden then hit Michael Jensen in the middle of the end zone for the touchdown. Nick Restaino’s point-after tied the game at 7-7 with 9:09 left in the first quarter. Both teams punted on their next possessions, with Moravian taking over at the Aggie 43 after DelVal’s kick. The Greyhounds moved the ball down to the eight-yard before settling for Wachter’s 25-yard field goal for a 10-7 advantage with 2:44 to go in the quarter. It stayed that way until midway in the second quarter when a defensive stop deep in Moravian territory and a Mike Anusky 19-yard punt return set the Aggies up with the ball at Greyhound 36-yard line. Darden hit Brian Norman for a nine-yard pass on a third-and-eight to keep the drive going. They moved the ball to the four-yard line and Darden took care of the rest with his legs as he broke the tackle to reach the end zone. Restaino’s boot gave DelVal a 14-10 lead with 8:25 to go before the half. Moravian later drove to the Aggie 25 and had a fourth-and-one when Wynne burst through and stopped running back Chris Negron for a one-yard loss to turn the ball over on downs. Shawn Miller later recorded an interception to stop another Greyhound first-half drive and the stanza ended with DelVal up four. Darden threw an interception in the end zone on the Aggies’ first drive of the second half, but they got the ball right back as Wynne stripped the ball loose after a short completion and Ethan Snyder recovered it at the Moravian 28-yard line. Five plays later, Darden hit a wide-open James Norton for a six-yard touchdown. Norton, a senior tight end, had a 16-yard reception to put the ball at the six. The extra-point attempt was blocked, but DelVal had a 20-10 lead with 6:26 to go in the third. The Greyhounds made it a one-possession game thanks to a 12-play, 92-yard drive in the fourth quarter. They converted a fourth down play on the possession and Negron culminated it by bulling into the end zone from a yard out. However, after a false start penalty backed them up five yards, Wachter’s kick went off the right upright, leaving it a 20-16 ballgame with 7:32 remaining. Moravian had two possessions down the stretch, but could not get into Aggie territory on either drive. DelVal then had a pair of kneel downs to secure the postseason win. Darden completed 10 of 19 passes for 126 yards and two touchdowns while also rushing for 31 yards and a score. Norton caught four passes for 35 yards and a touchdown. The Aggies, who were without the services of first-team all-conference tailback Devauntay Ellis, were led on the ground by Armani Fuller-Williams who netted 71 yards on 17 carries. Robert Cleveland added 58 yards on 15 attempts. Defensively, Bobby Marterella tied Wynne for team-high honors in tackles with seven. Miller added six tackles to his interception while Luke Boonstra had five stops and a sack. For Moravian, quarterback Mike Hayes was 21-for-41 for 259 yards. Negron notched 57 yards and one score on 14 carries while also catching five passes for 47 yards. Brendan Downey and Anthony Orlando led the defensive effort with nine tackles apiece. Orlando also had the team’s lone interception. Tim McCabe added eight tackles and one sack.